The vineyard is a time old tradition going back thousands of years. Growing the grapes that will become wine. Wine used in celebrations and rituals around the world. The vineyard holds a special place in my heart. I am not exactly sure why. When living in the San Francisco Bay Area, I used to love to drive about an hour north into the Napa and Sonoma Wine Valleys. The golden tinged dusty hills were alive with row upon row of vines. It was always a great get away from the hustle of the Bay Area. I really know nothing about the wine making process, other than the fact that the final product I like. I can never remember the varietals, vintages or vineyard’s wine that I like. Only that when I open a bottle, either I like it or I don’t. 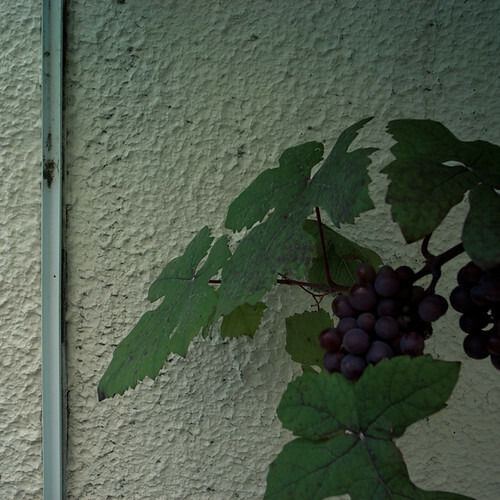 It was a friendly little reminder to come a across a tiny urban grapevine growing up and over a door in an urban setting. 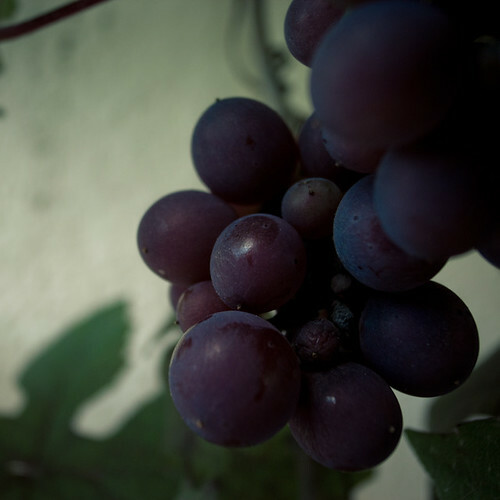 To see the purple hues of the grapes as they start to produce those desired sugars. Made me think back to my life before Japan. My life when I could jump in the car and in less than an hour I was riding among the vines. Or I could turn east, and drive up into the Sierra Nevadas. California really does have it all. A big shout out to all my peeps still in Cali. Genie! JJC!! Shay!! Dubfly!! This entry was posted on Tuesday, July 5th, 2011 at 11:19 am	and is filed under Photography Blog. You can follow any responses to this entry through the RSS 2.0 feed. You can leave a response, or trackback from your own site.